Creating Spark-Line in MS Excel - Something New Everyday! 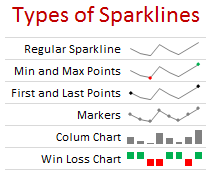 A Sparkline is a small chart that is aligned with rows of some tabular data and usually shows trend information. Here is an example of sparklines in a project team status report. How to create sparklines in Excel 2010? 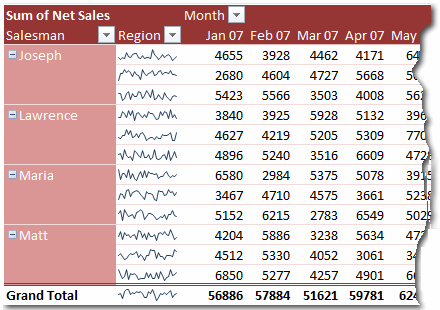 Creating sparklines in excel 2010 is very easy. You follow 3 very simple steps to get beautiful sparklines in an instant. Select the data from which you want to make a sparkline. Optional: Format the sparkline if you want. Here is a short screen-cast showing you how a sparkline is created. Sparklines & Missing Data – How does it work? If the sparkline source data contains non-numeric data, they are neglected while plotting the sparklines. 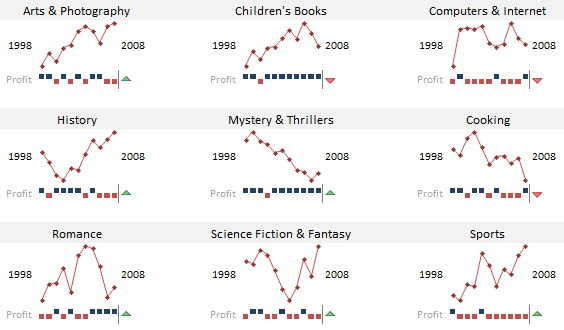 You can add sparklines to tables and pivot tables too. Adding them to pivot tables is a bit tricky (I will write about that when I master the trick) but adding sparklines to tables is fairly straightforward and scales nicely. Here is a bunch of quick tips & tricks for those of you starting on sparklines. You can auto-fill sparklines. Select the first set of values and add a sparkline. Now copy and past sparklines to auto-fill them based on data in adjacent cells. 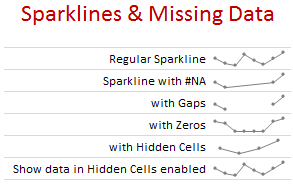 When you adjust row-height or column-width of the cell containing sparkline, the size of sparkline changes too. 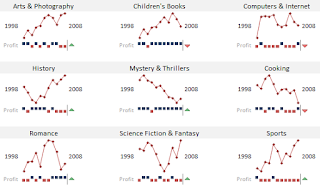 Juxtapose sparklines with conditional formatting icons to create stunning charts and dashboards. If you want to copy a sparkline over to a ppt or document, you can use “copy as picture” option. The sparklines feature is disabled whenever you open a workbook in “compatibility mode”.